This week is Shabbat Shirah, the Sabbath during which we read the Song of the Sea from the Torah. This is the moment in the text when the Israelites have finally escaped slavery, and they come upon the Sea of Reeds. Moses holds his staff up and the waters, miraculously, part. The children of Israel pass to freedom and sing this song, a text that includes the Mi Chamocha prayer, a text that is central to every worship service. 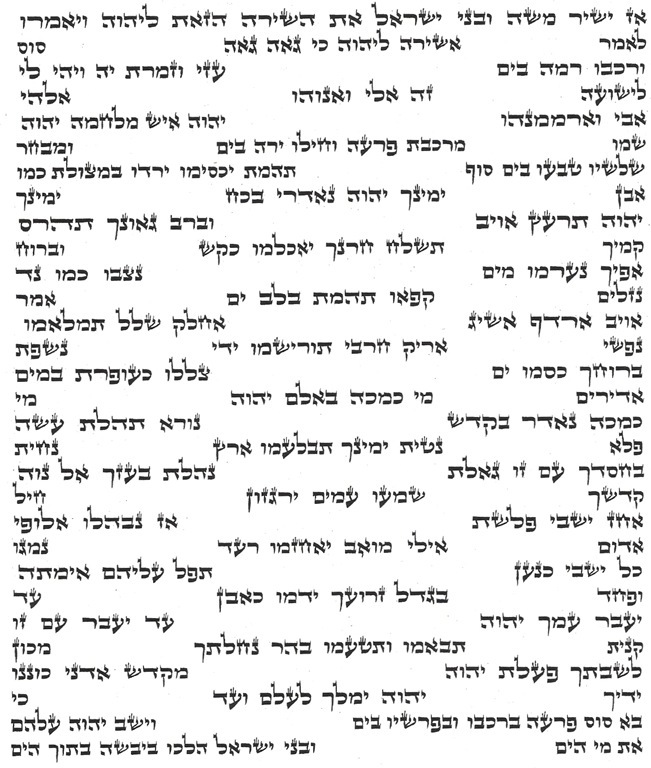 This is probably the oldest song ever written down and it is beautiful not only for its poetry and its melody (we use special chants to sing this section of Torah), but also for the art of its notation. Scribes write this poem in the Torah in three columns. There are at least three explanations that I have seen as to why it is written this way. Some say that it is to remind us of the bricks of slavery, others say that it represents the way the water would look in the parting sea, the third is that the columns to the left and right represent the parted sea and the center column represents the Israelites walking through to freedom. I like the third explanation the best. Let’s take a look at the Mi Chamocha text which is taken out of this Torah poem. The first line, “מִי־כָמֹֽכָה בָּאֵלִים ה” – Who is like You, G-d, among the gods that are worshipped,” appears in the center column – the column belonging to the Israelites. The rest of the prayer text, “מִי כָּמֹֽכָה נֶאְדָּר בַּקֹּֽדֶשׁ, נוֹרָא תְהִילֹּת, עֹֽשֵׂה פֶֽלֶא” “Who is like You, majestic in holiness, awesome in splendor, doing wonders,” appears, as it were, in the sea. Why do you suppose that is? The first line is so characteristic of the way that people often look at religion. What is everybody else doing, they ask? The people are recognizing in this question that their G-d appears to be a step above the rest, but isn’t it interesting that as they are noticing this about their faith, they are still looking around to comment on the other gods that people worship. The rest of the prayer, dealing in the holiness and splendor of G-d is written into the side sections, the parts that are designated as the sea. The holiness and splendor are written into the miracle for the people to see as they pass through. G-d among the gods is a theme that appears frequently in Torah text. The Israelites were one nation among many and those other nations worshiped many gods. How did our G-d compare? What miracles could our G-d do that theirs could not. It kind of reminds me of kids, each claiming that their father could beat the other’s in a fight. And indeed this moment does represent the childhood of the Jewish faith. We would have a long way to go after this moment to become the people that we would become. We left Egypt a mixed multitude, needing desperately to see and experience G-d directly. A desire that lead our people to commit the sin of the golden calf. We would have to learn how to believe in a G-d that we could neither see nor touch. We may have been an immature people, but we had the most basic element of faith down: Song. Once we had that, the rest would follow in its time. For what is wonder, joy, spirit, meaning, growth, or renewal without song? As always, your posting made for interesting reading and led to further thought. I was led by your writing to reflect upon how through the close reading of scripture, one can clearly see the slowly developing maturation of the relationship (on the side of the people) between G-d and His people. I think I see a pattern in the changes in the kind of things G-d asks and tells people, and that this pattern reflects changes in their perception/understanding of/relationship with G-d. This gestalt of relationship and understanding relationship was unique at each of its points in time in scripture, but also was a living, blossoming, growing thing, and it is wonderful to watch it grow. Through it, I think I see G-d’s love for us.